In a continued effort to combat our own digital addiction we present another article in Elite Care’s digital detox series. The past several years, the “Don’t text and drive” slogan has been engrained into our heads—and probably for good measure. Back in 2009, 18% of traffic fatalities involved distracted drivers (not just phone-use but also applying makeup, eating, talking to passengers, adjusting the radio, etc). But wait, the plot thickens. In 2013, the National Safety Council (NSC) released findings from a study analyzing the National Highway Traffic Safety Administration’s Fatality Analysis Reporting System (or FARS for short, since that’s a mouthful). The NSC scrutinized over data dating back for over two years, breaking down statistics involving fatal motor vehicle crashes and their causes to determine how the government had classified the accidents. The findings revealed a considerable discrepancy in how states coded cellphone-related crashes, and ultimately uncovered considerable underreporting of cellphone-related accidents. The NSC estimates that 1 in 4 motor vehicle crashes involve cellphone use—a considerable jump from the 5% reported by the National Traffic Safety Administration (NHTSA). Whatever the numbers are, it’s clear that distracted drivers cause accidents. In fact, on December 30, 2009 a Presidential Executive Order was released that restricted more than 4 million federal employees from texting and driving. From there, the states followed suit and began to enact their own laws. Here in Texas, we are one of 32 states that prohibit novice drivers from cell phone use—but before we all start patting each other on the back, we’re actually one of the most lenient states. Louisiana, and 38 other states prohibit all drivers from texting, while 10 states throughout the country don’t allow any driver to put the phone to his/her ear while driving. Okay. 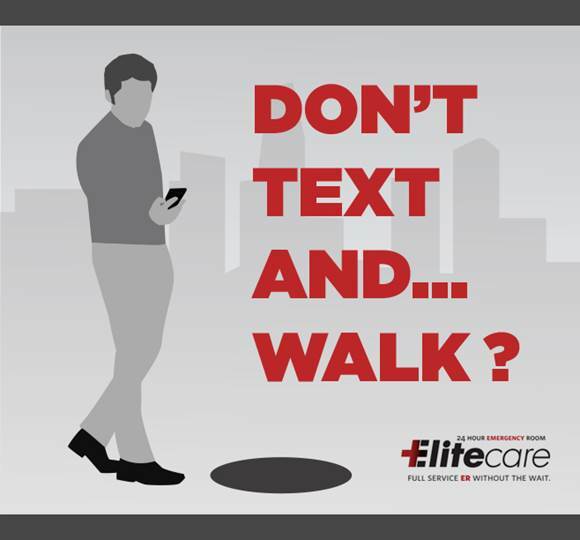 Get to it already—Accidents while texting and walking…really? Now that we’re all well aware that distracted drivers cause accidents—what about distracted pedestrians? What’s the solution to curb this dangerous, slightly ridiculous trend? Set a good example for your kids and others by waiting to answer that email or pick up that call until you’re in a place where your attention can afford to be diverted. Easier said than done, we know. As we recommended in our smartphone addiction post, try a “phone basket”—not only in the car to keep temptation out of reach, but also in certain rooms of the house, thus eliminating the craving to check or respond in scenarios that require your full attention. Making a habit of ditching the device in particular situations is a great way to get unglued from your smartphone. In the long run, it’s simple stuff—just watch where you’re going and remember that no matter what it is, it can wait!